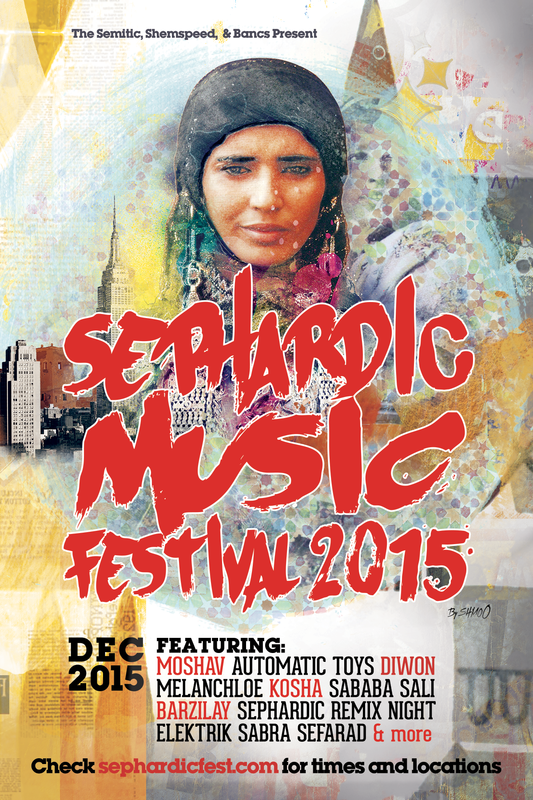 This Chanukah, after 10 years in NYC, The Sephardic Music Festival will be making its way to L.A. for its second year. The annual festival is a music and arts celebration showcasing musicians from around world that mix traditional, dance, electro, hip hop, and folk songs. SMF is the first music festival to focus exclusively on the less familiar but captivating culture of the Jewish communities of Spain/Portugal, North Africa, the Middle East, and Central Asia. Past SMF performers had included Yemen Blues, Yair Dalal, Matisyahu, Moshav, Asefa, Assaf Avidan and more. Founded by American-Israeli producer Diwon, the Sephardic Music Festival’s goal is unifying people through culture and education, celebrating diversity and common ground. The festival offers a platform for performers of traditional Sephardic folk music and innovators who fuse traditional Sephardic rhythms, melodies, and motifs with modern musical styles. With an incredible range of artists this year, the Sephardic Music Festival presents a colorful tapestry of music and culture as rich, vibrant, and diverse as the Jewish world itself. The winter festival will be held in Los Angeles from December 9th through the 14th. December 10th, 2015: “Sephardic Remix Night” is a special East meets West celebration of Jewish diversity with live music, DJs and Celebrity food blogger and chef, Nina Safar of Kosher in the Kitch fame. Diwon will fuse Yemenite music with electro hip-hop and cinematic psychedelia, drawing inspiration from the Middle Eastern musical canon, while a live bands (Electrik Sabra Sefarad & Sababa Sali) blends musical styles from varied traditions. In addition to all the music, Nina Safar will be giving latkes a Sephardic remix, as she fuses together traditional potato latkes with Sephardic flavors such as zaatar and cumin to create dishes like shakshuka latkes, sabich latkes, falafel latkes and more. December 12th, 2015: “An Evening With Moshav”. Join the festival for an evening with everyone’s favorite middle eastern, Jewish rock, reggae, roots band, internationally acclaimed American/Israeli rock group Moshav. The band began when childhood friends Yehuda (vocals, percussion) and Duvid (vocals, guitar) made music together on Moshav Mevo Modiin in Israel. The group was initially discovered by a group of American students traveling in Israel who heard the band play and raised money to bring them to the states for a college tour in the late 1990s. Soon after, Moshav relocated to Los Angeles where they continued to grow their fan base and began recording with some of the industry’s best.